Offering a precision engineered range of idli boilers.We provide a gamut of Idli Steamer / Boiler that is aptly designed to meet the need of bulk cooking of various kinds. Our ranges aid us in preparing a wide range of idli in most convenient manner. 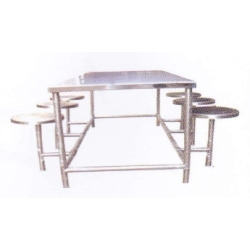 These are fabricated using finest quality raw material and customized as per the requirement of clients. .
We are among the trusted suppliers and traders of 4 Seater Dining Table that are available in different specifications according to the diverse needs and demands of the clients. 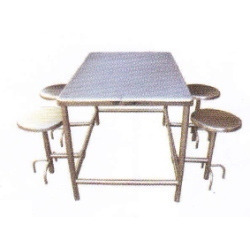 Robust designed these tables are offered along with the 4 seater that are attached with the tables. Each and every product offered by our company is well checked and analyzed on predefined quality parameters that enable us to gain complete client satisfaction. Our well equipped infrastructure facilities and highly skilled professionals enable us to supply and trade high quality 6 Seater Dining Table. Their large space and smooth surface allow maximum 6 people to sit comfortably. Owing to their reliability, unmatched quality and unique attributes, these dining tables are broadly demanded and praised among the clients all over the nation.